CAMERON, Wis. (CNS) — Faith runs deep in Barron County. The story of Jayme Closs’s abduction and escape is one of hope and courage, but it is also a story of faith, prayer and triumph over evil. On Jan. 20 at St. Peter Catholic Church in Cameron, family, friends, parish members and the wider community gathered to praise God for Jayme’s safe return. The ecumenical service brought a sense of closure and catharsis to the community, whose members have wept and prayed together since the October murder of Jim and Denise Closs and the abduction of their 13-year-old daughter, Jayme, but the joy was muted by remembrance of their deaths and acknowledgement of a young girl’s immeasurable suffering. Father John Gerritts, pastor of St. Patrick Parish in Hudson, and supervising pastor of parishes in the region, led the prayer service, which included prayers of thanksgiving for law enforcement, schools, friends, the community, Jim and Denise Closs, Jayme and the blessings of God. Contemporary Catholic musicians Luke Spehar, a singer/songwriter based in Minnesota’s Twin Cities, and Aly Aleigha, a Rice Lake, Wisconsin, native with an indie vibe, performed. Most members of the media were barred from attending. 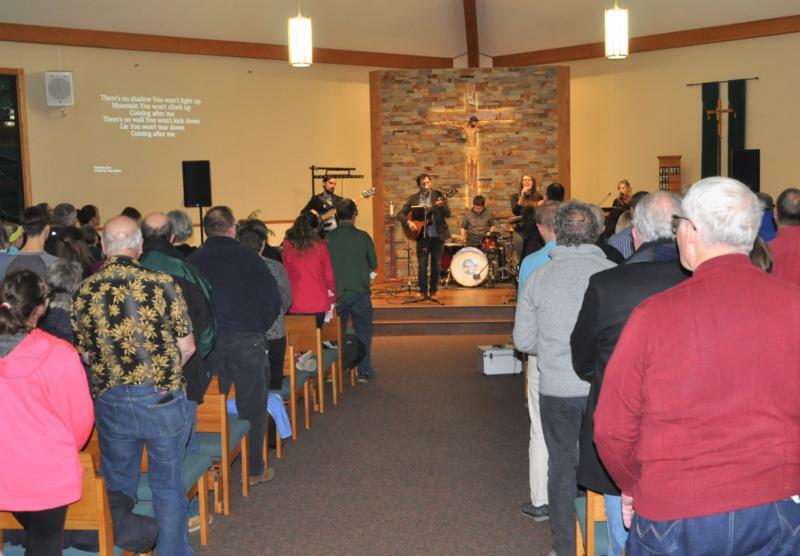 The 300-seat worship area was filled to capacity, with overflow seating in the hall. We pray to God in times of need, parish director Patty Gerber explained in her greeting, and so it follows that we show our gratitude when our prayers are answered. “Lord, we are grateful that faith has triumphed over evil,” Father Gerritts said in his opening prayer. An outsider to the parish, Father Gerritts characterized Jayme’s return as “one of the great miracles of our time” and praised a community that has endured trials and tribulations in the last two years — a deadly, record-breaking tornado and the murders of the Closses and abduction of their daughter — without blaming one another, pointing fingers or losing hope. St. Peter is Jayme’s family’s home parish. The funerals for her parents were celebrated in that church. She is now living with her aunt, Jennifer Smith, who also belongs to the parish. On Jan. 10, Jayme freed herself from the home of her abductor, Jake Thomas Patterson, in the town of Gordon in northern Wisconsin. Patterson has been charged with the Oct. 15 shooting deaths of her parents and with abducting the girl and holding her captive in his home for nearly three months. At the service, the theme of Barron County Sheriff Chris Fitzgerald’s address was never giving up hope — and gratitude to a community that encouraged, supported and continually fed his staff. At one point, more than 340 officers — his 87 employees, state and local law enforcement and federal officials — were all together for one briefing. Today, they are thankful for Jayme’s strong will to survive. “We will never give up hope again, and we never did,” he said. Also, they enjoyed the cinnamon rolls. “We’re the only people in a tragedy that gained weight,” he joked. Pastor Chad Halverson, of Barron Foursquare Gospel Church, acknowledged Christians are all “part of one amazing family,” and added, “We are privileged to lift up our law enforcement tonight.” He prayed for law enforcement, for their sacrifice and service, and for personnel who worked on the case. Diane Tremblay, administrator of the Barron School District, told Jayme, “We are so grateful for you,” and praised the community’s response to the tragedy. Tremblay spoke of finding “more meaning in everything” at the first Mass she attended after Jayme’s return — she quoted Isaiah 40:1, “Give comfort to my people, says your God,” among others — and spoke of keeping the Closs family in her personal prayers and saying the rosary for an increase in faith, hope and charity. “Jayme presents an increase in all three of those virtues … and that’s nothing short of extraordinary,” she added. He asked God to grant them wisdom as Jayme returns to class. Aleigha, the stage name of Aly Schissel, was on tour when Jayme was taken. She was inspired to write “Labyrinth,” a song about hope, strength and courage, and dedicated it to Jayme at every performance. Jayme’s cousin, Amanda Hoard, wept before offering a prayer of thankfulness for friends, and a prayer for healing. Melissa Salmonson offered the prayer for the community, and Lindsey Smith led a prayer for Jim and Denise Closs, thanking God for the gift they were to Jayme. “Thank you for driving out the darkness, and allowing Jayme to share her life with us,” she said. Draper is editor/reporter at the Catholic Herald, newspaper of the Diocese of Superior.